When an office building in downtown Scottsdale, AZ caught fire last night, there was hope that a complete catastrophe might be avoided when first responders arrived on the scene within minutes of the initial 911 call. But the evening was doomed to end in tragedy, as all the firefighters spent too long standing around outside the building learning each other’s names to save it from burning to the ground. What a heartbreaking turn of events. Fighting fires is no easy job, and sometimes, things just don’t go as planned. When they first arrived on the scene, firefighters immediately sprung into action by leaping from their fire engines to introduce themselves to the other firefighters present with a firm handshake and a smile. Knowing time was of the essence, the group rushed to form a large circle outside the burning office complex and launched into a couple of fun icebreakers as smoke poured from the open windows in the upper levels of the building. Though the responders tried their hardest to learn each other’s names, things looked shaky when it was discovered that two members of the group were both named Mark, and also that there were still many workers trapped inside the burning building. But the firefighters reacted expertly by buzzing through “two truths and a lie,” deciding that they were then ready to get the hoses trained on the flame-licked windows. That optimism was dashed, however, when one firefighter said, “Matt, can you help me set the ladder?” but was addressing Steven, so the group had to form a circle once again to nail down names. Matters only got worse when Lisa and Charles both had trouble thinking of a fun fact about themselves on the spot and asked if the others could circle back to them, and the roof of the building began to collapse into itself. By the time all the firefighters had made acquaintances and committed each other’s names to memory, the building had been reduced to a smoldering pile of ash and rubble, and there was nothing more anyone could do to save it. What a devastating turn of events. Though the firefighters tried their best to learn each other’s names as quickly as possible before they started fighting the fire, sometimes, fate has other plans. 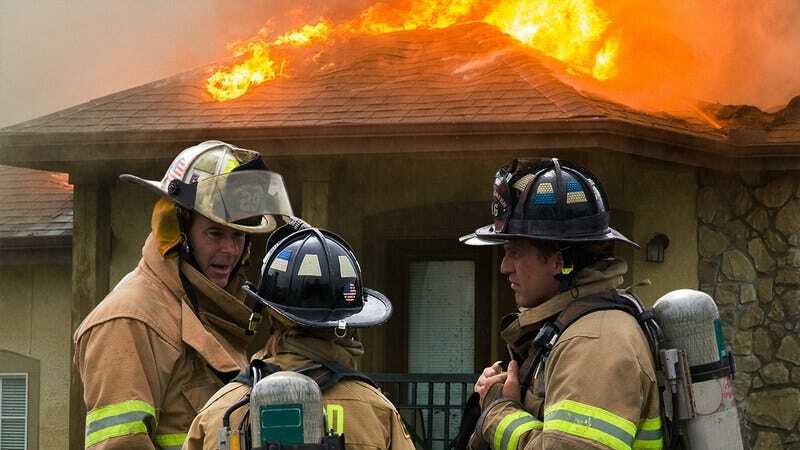 Though it’s tempting to speculate how things might have turned out differently if Derek hadn’t told that protracted story about how Sharon looked exactly like a girl he knew from high school, at the end of the day, these firefighters tried their hardest, and sometimes, that’s just how it goes.